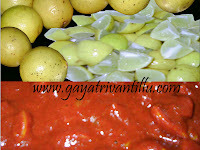 Select dabbakayalu which are juicy- soft to touch. While selecting dabbakayalu see that the skin is not very thick—thick skinned lime is best to prepare pickle where as for extracting juice use thin skinned and soft lime which will be juicy. Wash dabbakayalu and cut horizontally each into two parts. Use a citrus juice extractor to extract juice. Keep a bowl ready with a fine strainer on it. Place a cut lime on the extractor. Extract juice by pressing and turning the lime with pressure around the extractor. Juice may even be extracted using a food processor with citrus juice extractor attachment. Pour the juice collected into the strainer. Similarly extract the juice from the remaining lime. Collect the clear juice and measure it. Do not throw away the residue collected—keep this aside along with the skins of the dabbakayalu. Add salt to the juice little by little stirring. Mix the salt well in the juice to get saturated solution. If required add more salt to reach the saturation level. After mixing the salt, the solution should be left with some salt at the bottom of the bowl—then the solution is a saturated solution. So add more salt or restrain adding all the salt taken depending upon the saturation level. Add potassium metabisulphite and mix again. Take a clean and dry bottle. Pour the prepared juice into the bottle with a funnel. Close the lid and place this bottle in refrigerator. Use this juice to add sourness to the recipe. But remember to moderate salt in the recipe as this juice already contains more salt. Cut the skins of lime into small pieces. Fix the chopper blade in the food processor. 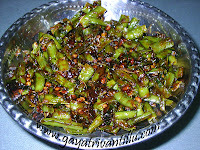 Add the seeds and chopped skins of dabbakayalu into the processor bowl and run it. Run the processor till the mixture is finely chopped. Grind this finely chopped mixture in a mixer grinder. This way the peels and seeds will be ground to a fine texture—this will help in drying the mixture fast. Spread a polythene sheet in sun and spread the ground mixture on it. Dry the lime peel-seed mixture in sun for two days or till crisp. After 2 days of sun drying, once again grind the mixture to get a further fine textured powder. The ground powder if observed will be coarse and needs further sun drying. Spread this coarse powder in a plate evenly and dry in sun for one more day. Again powder this mixture in a mixer grinder. Sift this ground powder through a fine sieve. Use the coarse residue as a face scrub and use the fine powder after mixing it with multani mitti as a face mask. Take a table spoon of the coarse residue in palms and wet with some water. Use this mixture to scrub the face to remove dead skins. Take one teaspoon of multani mitti and add 1/4tsp of the lime peel powder and a pinch of turmeric powder. Mix all dry powders and make a paste adding water little by little. Apply this paste on face and neck and keep it on till it dries up-- (best thing is to apply this paste and lie down with closed eyes and relax). When it dries completely wash it off with water. The lime peel contains lot of moisturizing qualities with a pleasant smell. These powders are for external use only. Make a paste of this powder and apply on brass, copper vessels and then wash it off with dish washing powder. This will give shine to the ware. Mix the powder with other powders like green gram powder and fenugreek powder and use as a hair pack to condition the hair. With this rough lime there are many uses—isn’t it? Nothing goes waste from this rough lime!!! !